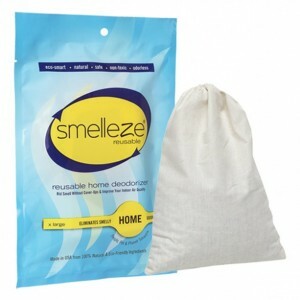 SMELLEZE Natural Garbage Smell Deodorizer Granules: 25 lb. Bag Sprinkle on Garbage Summary Smelleze® Eco Garbage Odor Removal Granules eliminates garbage smell without masking with harmful fragrances. Garbage odor doesn't stand a chance. Safe for people, pets & planet. This green odor removal deodorizer really works to get rid of stinky garbage smells & odors. Features & Benefits • Simply sprinkle and smell the difference • Eliminates garbage smell instead of masking it • Eco-friendly, safe, non-toxic, natural, odorless • Creates a cleaner, healthier, safer, environment • Reduces fly infestation & bacteria • Made in USA Destroy Stinky Dumpster, Compactor & Garbage Odors! The stench from garbage can be a big problem especially in warm weather for businesses such as restaurants. In addition to stinky smells, you could also be inundated by flies, maggots, ants and other insects. Offensive garbage odors could also lead to complaints from customers and create a negative image for you business. 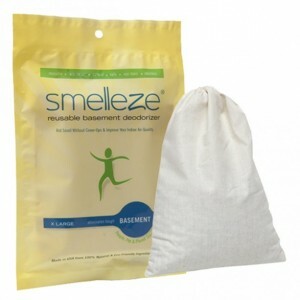 The Smelleze® Garbage Smell Removal Granules were specially developed to destroy pungent garbage odors on contact without masking them with fragrances. For a breath of fresh air, simply sprinkle these environmentally friendly granules in the dumpster, compactor or garbage can and smell the difference. Smelleze® Garbage Smell Remover Granules will truly cleanse the air of offensive garbage odors, reduce insect infestation, complement existing ventilation systems and result in a fresh smelling environment. This will help create a healthy clean environment that will be appreciated by the customers and employees. As an added benefit, Smelleze® Garbage Odor Removal Granules also makes an excellent additive for smelly garbage used for composting and will eliminator flies. Smelleze® Garbage Odor Remover Granules are non-toxic, safe, natural, odorless, non-flammable and non-caustic. 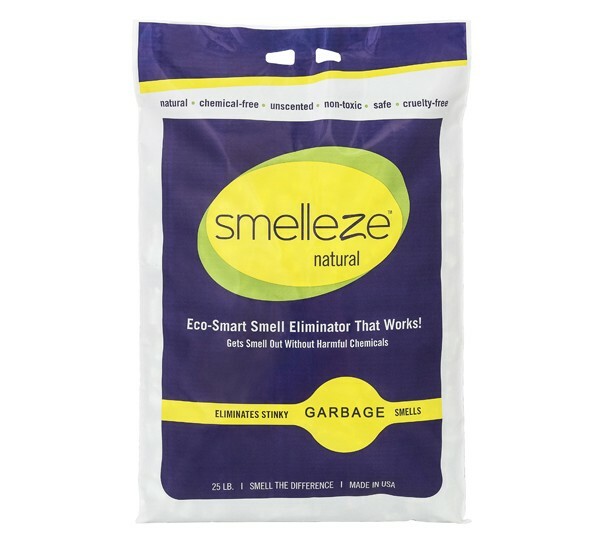 Smelleze® Garbage Smell Eliminator Granules are an ideal environmentally friendly solution for eliminating stinky dumpster, compactor and garbage odors without adding pollutants to the air you breathe. It does not contain VOCs, harmful or ozone depleting chemicals and is especially beneficial for those suffering from allergies and chemical sensitivity. No fossil fuels are used in the production of Smelleze® odor eliminator deodorizer media.